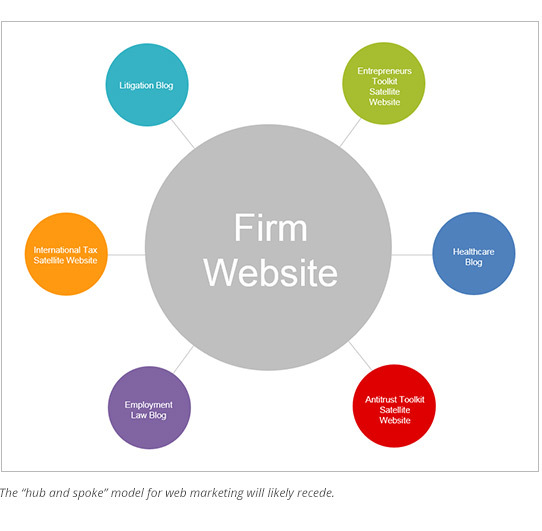 Most of today’s law firm websites are stuck in the 20th century. For the most part, they essentially are electronic brochures that are meant to complement old-fashioned, face-to-face business development and networking. 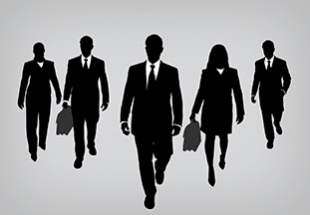 Most law firm websites aren’t even intended to generate new business leads. Some law firm websites are about to make an evolutionary leap. They will transform from being digital brochures – to becoming the most important cog in the firm’s lead-nurturing ecosystem. Fascinating. 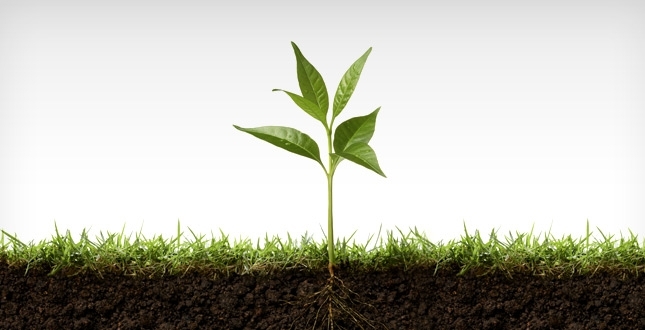 But what the heck is a lead-nurturing ecosystem? 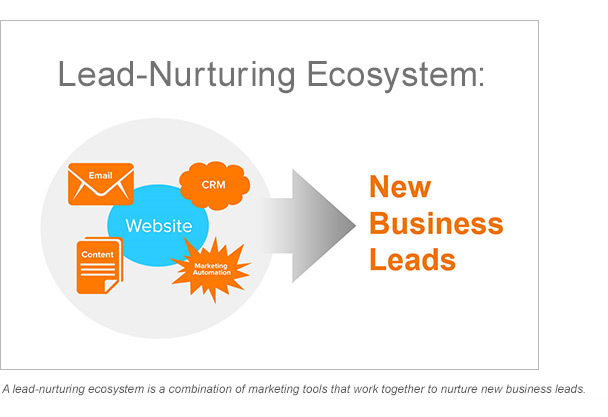 A lead-nurturing ecosystem is a combination of marketing tools that work together to generate new business leads. Engages Prospects – It actively engages and nurtures prospects by feeding them compelling content. This happens primarily on your website and via email. Tracks Their Every Move – The system tracks and records every time your prospects engage with your marketing content. Offers Compelling Content – Content is the system’s lifeblood. Without it, you can’t engage and track prospects. Together, these three things enable a lead-nurturing ecosystem to produce a list of high-value leads, complete with numerical scores indicating their likely level of interest. Identify your website visitors – by name! Knowing the name of the person who visits your website, plus what they do while present, provides marketers with data that are actionable in a way that Google Analytics has never been. But gathering data for your business-development staff to act upon is just the start. In a lead-nurturing ecosystem, the tools are actually smart enough to act on the captured data, automatically. The system is able to nurture and engage prospects by sending just the right content, to just the right person, at just the right time. If the person didn’t attend, it will automatically send the person a link to the recording of the webinar. Over the course of months after the event, it sends articles and updates related to Reinsurance, and along the way, the person is invited to similar events. This is called lead-nurturing, and it’s something that marketers currently do by hand. A lead-nurturing ecosystem automates this – delivering quality leads with much less effort. But a lead-nurturing ecosystem does something else that can potentially be more significant for legal marketers. Something that has eluded marketers for far too long...it quantifies success. It shows the exact path that a person takes from being a prospect to becoming a client. For example, imagine someone reads a whitepaper one of your attorneys has written. They’re impressed, so they sign-up for a newsletter to receive more great content like this. Over time, that person visits bios and reads news items and related articles. And then, 12 months later, they become a client. The info gathered shows “cause-and-effect” – and that’s huge because it gives legal marketers the ability to move what they do from being a kind of “art,” to becoming a science. Finally, CMOs will have the concrete data that they require, to justify why resources should be dedicated toward a particular marketing initiative rather than another. For a lead-nurturing ecosystem to work, your website and marketing content need to keep visitors engaged – and wanting more. This is because the system identifies which prospects are worth pursuing based on the amount and type of content a person consumes (articles, events, webinars, etc.). A greater focus on content. More than ever, it will be vital to create a steady stream of compelling, reputation-enhancing content. Magazine-like pages. Page layouts will be far more engaging and accessible. You will likely see more graphical representation of information in order to draw people in – and keep them surfing. Calls to action. 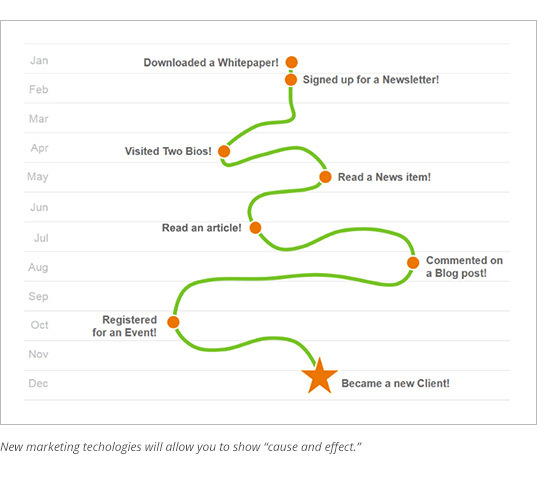 Various prompts to sign-up for related events and newsletters will appear on every piece of content, and throughout the website. But the trend towards lead-nurturing ecosystems will also force law firm marketers to rethink the structure of their entire web-marketing universe. The result will likely be that they end up abandoning the “hub and spoke” model. What’s hub-and-spoke? It’s when a firm has one large website (for the entire firm) surrounded by smaller satellite websites and blogs – each addressing a particular issue or topic, and each accessible from its own domain name. The problem is that this model inadvertently sets up barriers that prevent visitors from seamlessly accessing content. People don’t like clicking from one website to another. It compromises their user-experience, and consequently, hurts engagement (and tracking). For this reason, we expect that you’ll soon see a firm’s blogs and other satellite websites become absorbed within the firm’s larger website. We call this the “nest” model. Here’s the big picture: increasingly your website will be expected to generate leads from people located far away – whom your attorneys have never met face-to-face. Many legal marketers will likely spend the rest of their careers figuring out how to make this happen. 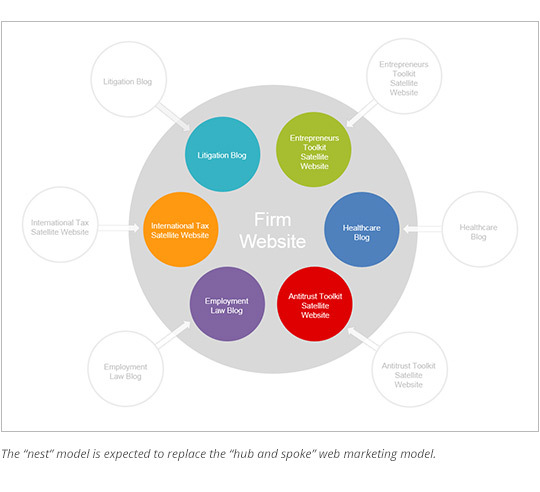 Transforming law firm websites from digital brochures into effective lead-nurturing ecosystems won’t be easy. However, the ambitious firms that embrace this challenge now – and figure it out first – will have a huge head-start over their competition. Amazing how people trade one set of buzz words for another but still end up saying nothing. The problem with the average lawyer web site, is that it tends to list the lawyer’s bio, club memberships and say nothing about what they can do for the client. 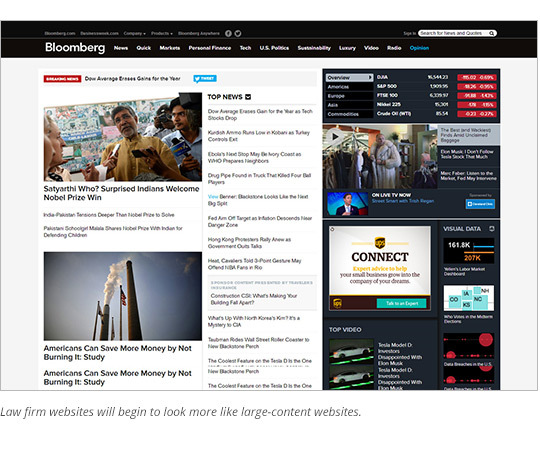 Until that changes, lawyer web sites are a waste of space. WOW, Kirby…your comments are quite insulting. There are quite a few of us legal marketers that work diligently to make our websites more engaging. I also find it a bit hard to believe that 100k people last month found our content a waste of space. That may not be a huge number to a retail company or news site, but for a 110 attorney regional law firm, I think its damn impressive! And by the way – lawyers do have other lawyers as clients too. Thank you, Robert for a great post, as always! 1. I haven’t a clue how I got on your mailing list. 2. That being said, what a great marketing tool to have people write in w/things like “100k people visited our website last month” along w/the fact that it’s a mid-size firm (very specific sales “fix your pain” lingo and “contact me re your services” (as opposed to contacting you directly which most people would do) to demonstrate that your marketing techniques work. 3. I think that this was rather clever. I’m really not being caustic. I honestly and actually do think this is the way that people today emerged in social media where direct sales is now a “no-no” would want to get information. No one wants the old cold call or cold email anymore. Chere – Thank you for your note. You are correct — nobody wants to receive cold calls. So, smart marketers write compelling content — and create a forum for people to share their ideas. If done right, that will generate new business. Thank you for your compliment on our cleverness. Sadly, it’s a compliment that we cannot really accept. We just create the forum – and let people write in what they like. That said, our reader community is awesome and we’re grateful for every bit of feedback we receive on the thought leadership that we create. FYI, the reason you received an email from us is because you signed up for our newsletter on 5/2/11. That was a long time ago so you may have forgotten. If you’d like, we’d be happy to unsubscribe you. Let me know. Thanks! Very well detailed and useful information you have shared. The representation is also very nice. Keep sharing.